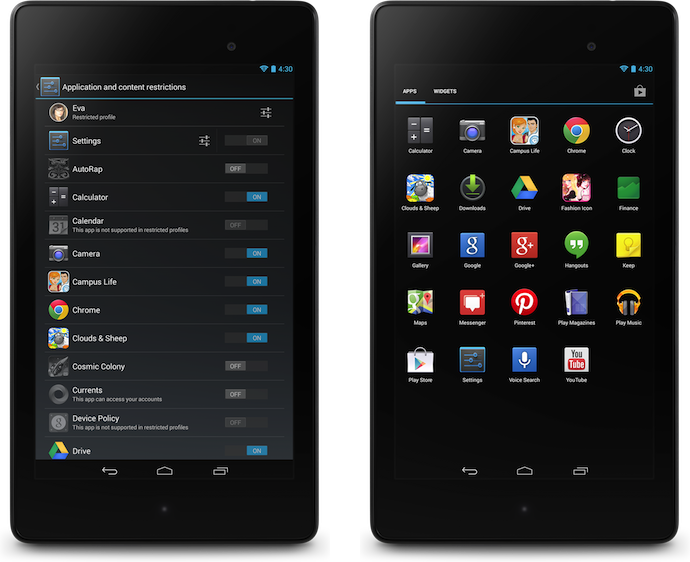 In Android 4.3, we're introducing restricted profiles, which let you manage per-user access to apps and content. Restricted profiles can be used in any number of situations. For example, restricted profiles enable parental controls, so certain family members are prevented from accessing mature content. Alternately, retail stores can use tablets as kiosks that show product information, or shops can use tablets as point of sale systems, all while limiting access to apps. Devices like the new Nexus 7 support OpenGL ES 3.0, the latest industry standard for accelerated 3D graphics. This brings photorealism to a whole new level in the games you're playing: blades of grass on the soccer field come alive, asphalt on the street looks real as you screech by, stubble on a villains' face almost pokes out of the screen. And with sophisticated effects like self-shadows, that villain looks even more menacing, casting a shadow on himself. We’ve made major progress on enabling right-to-left layouts across the platform user interface: dialer, home and lock screens, settings, and more. This work builds on the support that we introduced for right-to-left layouts for Hebrew and Arabic speakers in Android 4.2. We’ve also added support for Hindi, Afrikaans, Amharic, Swahili, and Zulu. and the new Nexus 7 tablet, it’s even more effortless to enjoy content you care about—whether it’s video, music, movies, games—wherever you are, across your devices. Introducing Chromecast To help make it easy to bring your favorite online entertainment to the biggest screen in your house—the TV—we’re introducing Chromecast. Chromecast is a small and affordable ($35) device that you simply plug in to your high-definition (HD) TV and it allows you to use your phone, tablet or laptop to "cast" online content to your TV screen. It works with Netflix, YouTube, Google Play Movies & TV, and Google Play Music, with more apps like Pandora coming soon. With Chromecast, we wanted to create an easy solution that works for everyone, for every TV in the house. Remote-free Once your Chromecast is set up, you can use your phone, tablet or laptop to browse and cast content to your TV, play and pause, control the volume, and more. But unlike other streaming solutions, you can still multitask—send emails or surf the web—while enjoying what’s on the TV screen. It works across platforms—Android tablets and smartphones, iPhones, iPads, Chrome for Mac and Windows (more to come), so your personal device is also now your remote control. Cast the web to your TV In addition to apps like Netflix, you can use Chromecast to bring a broad range of content available on the web to your big screen, thanks to a new feature in the Chrome browser that allows you to project any browser tab to your TV. From sharing your family photos to enjoying a video clip from your favorite news site, it’s as simple as pressing a button. This feature is launching in beta, but we’re excited for people to try it out and give us their feedback. Google Cast SDK preview for developers To ensure a great Chromecast experience over time, we've built Google Cast, a technology that enables developers to build consistent, intuitive multi-screen experiences across mobile devices and TVs. Today, we’re launching a preview version of Google Cast with more information for developers on our Google Developers blog. A handful of early developers are already working on enabling Google Cast technology in their apps, so more supported apps are coming soon. And while the Chromecast device is the first instantiation of Google Cast, we expect the technology to be embedded in a range of hardware from our partners in the future. 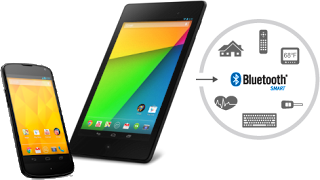 The new Nexus 7—the sharpest 7” tablet screen ever Together with ASUS, we took what you loved about the original Nexus 7 and made it even better. The first thing you’ll notice is the sharpness of the screen: the 323 pixels packed into every inch of the screen makes it the world's highest-resolution 7-inch tablet. It’s lighter than ever, with more than nine hours of HD video playback and 10 hours of web browsing or reading. 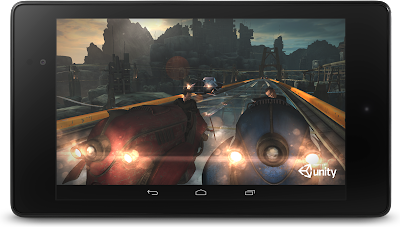 Nexus 7 now features stereo speakers and virtual surround sound from Fraunhofer (the inventors of the MP3 format), giving you rich and immersive audio. Android 4.3—a sweeter Jelly Bean Nexus 7 is the first device to ship with Android 4.3, the newest version of Android. Tablets are perfect for sharing with others, so in Android 4.3, we're introducing restricted profiles, which let you limit access to apps and content. For example, restricted profiles enable parental controls, so certain family members are prevented from accessing mature content. Likewise, retail stores can use tablets to show off product information, and shops can use tablets as point of sale systems. Android 4.3 also now supports Bluetooth Smart technology, opening the door to mobile apps that connect to new devices like fitness sensors. Android 4.3 is rolling out to Nexus devices starting today. Ready to Play The new Google Play Games app brings your friends together with the games you love, where you can invite a friend and start challenging gamers around the world, compete for top achievements, and race to the top of the leaderboard. You can also enjoy the world’s largest collection of eBooks, listen to millions of music tracks and immerse yourself in thousands of movies, TV shows, magazines and apps on Google Play. 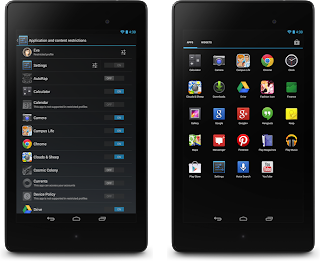 Plus, Nexus 7 comes loaded with your favorite Google apps, like Chrome, Maps, YouTube, Gmail and Google Now. 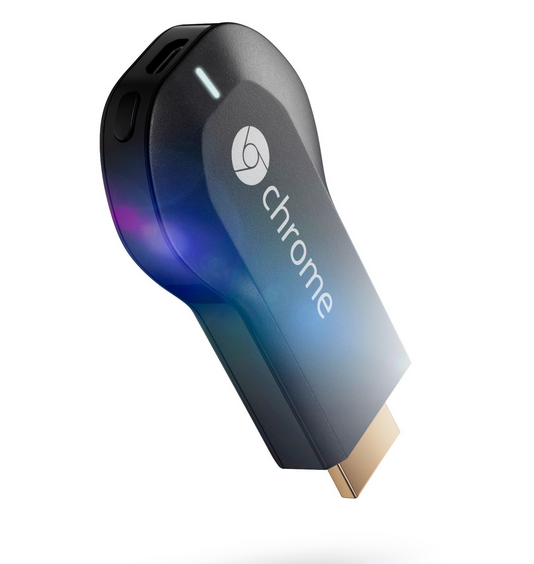 How to get Chromecast and the new Nexus 7 Starting today, the Chromecast device is available for $35 on Google Play, Amazon.com and BestBuy.com. It will be available in Best Buy stores across the U.S. starting July 28. For a limited time, you also get three months of Netflix included. More info available in Google Play. Nexus 7 starts at $229, and is available in the U.S. beginning July 30 (with more countries coming soon!). Buy Nexus 7 online on Google Play, or check it out at Best Buy, Gamestop, Walmart, Staples, Office Max, Office Depot, Amazon, Home Shopping Network, Radio Shack, J&R and B&H Photo. 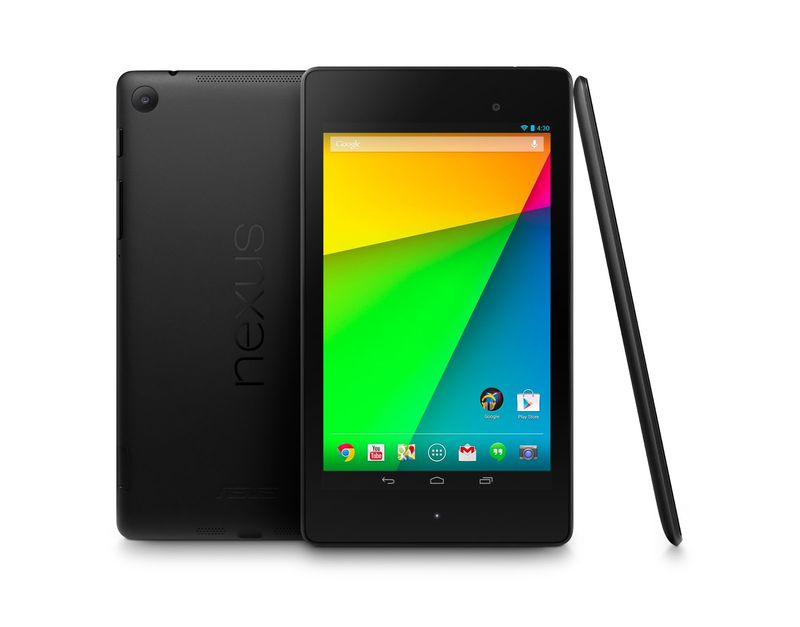 Nexus 7 (LTE) is coming soon with support for T-Mobile and Verizon in the coming weeks. Learn more on our Nexus site. When I was growing up, my family had a single screen we huddled around every day: the television set in the living room. Nowadays, we “huddle” around multiple screens—laptops, smartphones and tablets—using them almost interchangeably as we navigate through our day. In a world of ubiquitous computing, life would be a lot simpler if we didn’t have to learn new behaviors and interfaces each time we switched screens—if we could have one consistent, intuitive experience no matter where we are or what we’re doing. Today, with the launch of Chromecast and the new Nexus 7 tablet, it’s even more effortless to enjoy content you care about—whether it’s video, music, movies, games—wherever you are, across your devices. Introducing Chromecast To help make it easy to bring your favorite online entertainment to the biggest screen in your house—the TV—we’re introducing Chromecast. Chromecast is a small and affordable ($35) device that you simply plug in to your high-definition (HD) TV and it allows you to use your phone, tablet or laptop to "cast" online content to your TV screen. It works with Netflix, YouTube, Google Play Movies & TV, and Google Play Music, with more apps like Pandora coming soon. With Chromecast, we wanted to create an easy solution that works for everyone, for every TV in the house.